One other parameter that must be agreed upon is the router priority for DR/DBR elections. ::/128 = unspecified address which is essentially the DFG for IPv6, all the bits are set to 0. N.B. - Timers do not have to match but they must be equal. - Adjacency will flap if timers are mismatched. - Therefore ensure you have a reliable time source. The adjacency is up if the neighbor has put you identity in their hello packet. 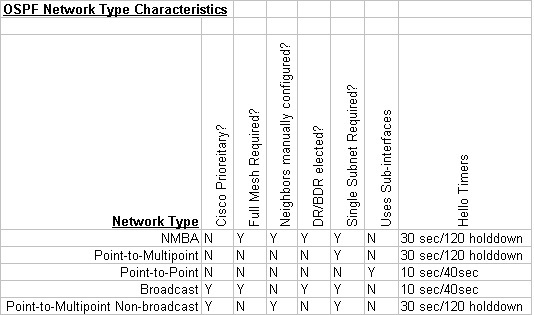 The OSPF metric is cost, which is calculated using the equation 100Mbps/Bandwidth of interface. The 100Mbps is a reference bandwidth which is applied in order to calculate the Cost of an interface. The Cost is an indication of the overhead to send packets across that link. Lower Costs are better. The default OSPF Cost is used to calculate the best path. The best path is then entered in to the routing table (assuming there isn't another protocol with a better AD with the same path). In order to refine your traffic shaping you can change the reference bandwidth so that you can determine the best path when considering FE and GE links, as you'll note that the default cost is the same and there fore determining the best path between the two could result in sub-optimal routing. When redistributing another routing protocol in to EIGRP you need to specify the metric weights in order to redistribute the routes correctly and efficiently. Alternatively you can define a 'Seed' metric which is applied to all redistributed routes and so you don't need to specify the individual metrics each time. 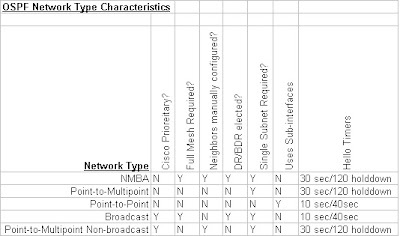 In both of the examples above you are manually setting out the metric for the routes once they are redistributed in to EIGRP. If you fail to set either a default metric or a specific metric in your redistribute command then EIGRP will assign a metric of 'infinity' and the routes will fail. So if you end up scratching you head wondering why your desired routes don't appear in the routing table take a look at your metrics. iv) Reliability (K4) - A value representing how likely the path is to be available or fail. Value is between 0 and 255, with 255 equalling 100% reliable. ESTABLISHED - peering established, routing begins. To view this activity you can use the debug options to see the process in action.